On the final day of the 62nd session of the WHO Regional Committee for Europe the WHO Member States adopted the Strategy and Action Plan for Healthy Ageing in Europe, 2012-2020 (discussed on Day 3), and the European Action Plan for Strengthening Public Health Capacities and Services. Introducing the European Action Plan, Dr Hans Kluge, Director of the Division of Health Systems and Public Health, remarked that this was a "great moment, as public health is being revived in the European Region". He explained that the Plan had been developed through an extensive consultative process to strengthen integrated service delivery in health protection, disease prevention and health promotion. Given the challenges affecting societies in the 21st century - globalization, ageing populations, climate change - a renewed focus on public health is both timely and appropriate with a view to achieving the best health outcomes with limited resources. advancing public health research to inform policy and practice. Dr Kluge outlined the key elements of the resolution, which include taking forward the Action Plan as a pillar for implementation of Health 2020, acknowledging the revised EPHOs and the countries' need to assess their EPHOs, and collaborating on implementation under the leadership and with the support of WHO. A self-assessment tool for countries that was developed in conjunction with the Plan will be developed further and simplified. During the extensive consultative process with Member States, the European Commission and nongovernmental organizations, adjustments were made to increase the focus on the social determinants of health, bring the time frame for implementation of the Action Plan in line with that of Health 2020, and develop a common glossary of terms. Cyprus, on behalf of countries of the European Union (EU), expressed its broad support of the Plan, with some minor changes to emphasize the importance of partnerships (with civil society, the private sector and the public through patient empowerment), primary health care, and the voluntary nature of the actions and measures. Other countries reiterated their support, stating their commitment to undertake further reviews of their public health services and integrate the revised EPHOs in their national strategies and systems. 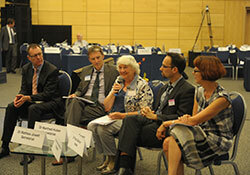 Dr Maria Ruseva, who recently retired from WHO/Europe, was praised for her commitment to public health and her essential role in developing the Plan. Dr Lucianne Licari presented the Regional Office's country strategy, which is being revised for the first time in more than a decade. Dr Licari described the strategy as one that calls for a new way of working that is more flexible, more proactive and more relevant to every Member State of the Region. It also emphasizes the importance of intercountry work and provides suggestions on how to ensure information exchange across countries and on ways of working more closely with countries that do not have a WHO country office. Although the strategy presented is intended as an interim document, Dr Licari suggested that the vision it contains would be valid over the coming years and would help shape a long-term strategy in line with Member States’ expectations. Having held regular consultations with Member States on this topic over the past two years, as well as three subregional consultations, Dr Licari concluded that the close collaboration she experienced during these events made her confident that the strategy well reflects the Member States' views and ideas. One of the key elements of the country strategy is the voluntary development of country cooperation strategies (CCSs) with those countries that do not have biennial collaborative agreements (BCAs) with the Regional Office. Dr Licari pointed out that Switzerland is already in the process of creating a CSS and other countries have expressed interest in beginning the process. Several Member States expressed their support of and gratitude for country offices. This was acknowledged with appreciation by the heads of country offices present, some of whom expressed full support of the draft resolution. However, the EU Member States stressed that, as part of its ongoing reform process, WHO is still exploring appropriate functions at all three levels of the organization, including the country level. They said that consultations during the past two years had revealed differing views and little consensus on the vision for the future or the need for an interim strategy, a fact that was reflected in the draft resolution. They suggested adopting the resolution containing the most important points necessary to allow WHO/Europe to move forward with its work without endorsing the strategy itself. The EU Member States proposed a significant number of amendments to the resolution to reflect this suggestion. Following comments from Member States, Dr Licari clarified that, while BCAs constitute action plans, the proposed CCSs would constitute strategies. The Regional Director, Ms Zsuzsanna Jakab, confirmed that WHO/Europe takes WHO reform into account in everything that it does, which was one reason for creating an interim country strategy in this case. CCSs would not only allow collaboration between countries and the three levels of WHO but would also enable the countries to contribute to global and regional health development. Delegates were given the opportunity to review the draft resolution with the substantial number of EU amendments during the lunch hour. The resolution was adopted with those amendments. In addition, the establishment of a GDO on noncommunicable diseases (NCDs) in Athens, Greece, is currently pending. Ms Jakab explained that GDOs provide sustainable funding for building technical capacity in key strategic areas, which would otherwise not be possible. She thanked those countries that support the work of the Regional Office in this way. Over the past two years, the role of GDOs has been through an external review, the first in a decade. The review noted that the GDOs undertake good, high- quality technical work, but that coordination with the Regional Office should be strengthened and further recognition of the role of the host country given. Since the review began, these issues have been addressed by the Regional Office. are established or phased out only after a full assessment of business needs has been made. In addition, the strategy proposes three new areas where additional GDOs could be established: humanitarian aid and emergencies; health systems strengthening; and health information systems and knowledge management. Extensive debate by Member States followed the introduction to the strategy. Countries expressed different opinions on whether the decision to establish a new GDO should be made by the Standing Committee to the Regional Committee (SCRC) and the WHO secretariat, or if it should be put to the Regional Committee. In addition, delegates asked for greater transparency in identifying technical areas where there is a need to establish a new GDO, as well asnd in the process of doing so. After further discussions, Member States agreed to give WHO the mandate to establish a GDO on NCDs in a candidate country should Greece withdraw as host. They also asked WHO, in consultation with SCRC and candidate countries, to develop business models in the technical areas of primary health care and humanitarian crises, and propose these for adoption at the next Regional Committee session. Experts at this lunch-time briefing reflected on challenges to health systems of an ageing population and the implications for managing multiple chronic diseases. For example, in several Organisation for Economic Co-operation and Development (OECD) countries, people aged 65 and over have three or more chronic conditions. In western Europe, dementia is projected to increase by 93% from 2010 to 2050. It is important to recognize that chronic morbidity now begins earlier in life, and that health promotion is important throughout the life course. There is a need for further research on the adverse interaction of drugs. There is a need for further evidence-gathering on co-morbidity, as research currently focuses on single diseases. Multidisciplinary teams that put the patient at the centre would serve individuals better. Effective information technology (IT) systems can do much to track patients and identify those at risk so that health care at the community level can be provided at an earlier stage. It is necessary to change attitudes and social stigma related to mental health. Mr Arun Nanda introduced this topic with a presentation on the evaluation of the High-Level Forum (HLF), which was created following RC60 as a strategic-level forum for consulting Member States on the development of Health 2020. HLF held three meetings in 2011 and 2012 and participants were asked to assess the usefulness of this Forum. With a response rate of 81%, the evaluation concluded that there was universal agreement on the usefulness of HLF. A majority (63%) of respondents said they would like HLF to continue 1-2 times a year, while 23% said they would like it to continue only as and when and as needed, and 14% of respondents stated that HLF had served its purpose and should no longer be continued. Dr Ray Busutill, expressing the views of SCRC on the topic, confirmed that the aims of HLF had been achieved and that it had helped to hasten the formulation of Health 2020. He offered the opinion that HLF should be maintained but should meet only when SCRC deems it necessary, e.g. for specific issues. The EU Member States expressed that they did not see a need for a body like HLF but would prefer to focus on making the best use of existing bodies. They voiced concerns about duplicating work and raised the question of whether written communications would be a cost-effective alternative to holding high-level events. In view of a lack of consensus, the Executive President suggested moving on from this agenda item. 66th Session: Copenhagen, Denmark, dates to be decided. "To quote a Maltese saying, ‘the word of a Maltese is stronger than the promise of a king'. We have all become real Maltese at this session and take responsibility for what we have said and agree to put it into action." Describing the adoption of Health 2020 as 'historic', Ms Zsuzsanna Jakab, WHO Regional Director for Europe, thanked the Member States for their engagement, the SCRC for its detailed preparations, and the Maltese Government for hosting this successful Regional Committee Session.